"I personally have a few hundred dollars worth of books on controllers, PID algorithms, and PID tuning. Since I am an engineer, I stand a chance of understanding some of it. But where do you go if you want to understand PID without a PhD? Finn Peacock has written some very good material about PID which simplifies understanding. What follows here is an excerpt from his Idiots Guide to PID Algorithms, reprinted with his permission. I don't make a dime off this endorsement. I simply provide this introduction because I found Finn's material to be an excellent simplified discussion of PID." -- Jim Hogenson. Did you ever wish you could monitor something simple without installing a whole expensive monitoring system? Did you ever wish that one particular piece of equipment you're keeping an eye on could just send you a text message when something gets out of line? Did you ever wish you had a simple way to just send a text to a piece of equipment and get a reply telling you how things were right then? All of these are possible with the Control Solutions i.Report Text Messenger. The i.Report Text Messenger is a self-contained remote monitoring and alarm notification system that monitors data points in one or more Modbus or BACnet devices and alerts you and others via SMS when an event has been detected that somebody should know about. The i.Report Text Messenger offers simple yet powerful remote monitoring without the need for a monitoring service - no contract required. 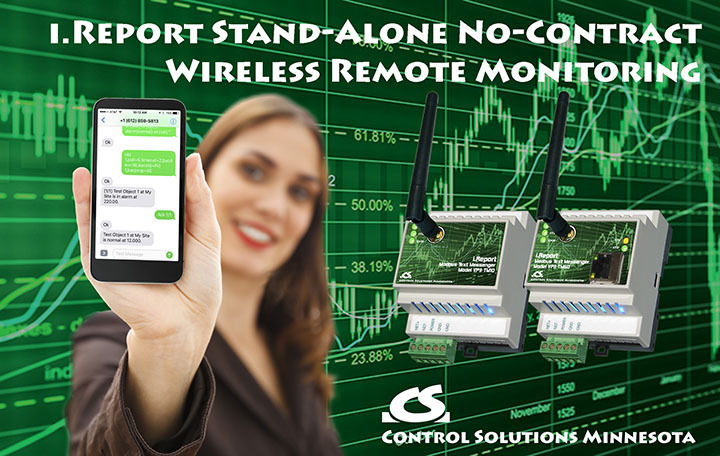 Find out more about this exciting remote monitoring option and get yours here. IB-100 Internet I/O Board with Web Server and Modbus TCP Built In! Plus Script Basic Built In! The IB-100 provides a simple and cost effective web appliance for facility management and remote monitoring. The IB-100 web server includes an impressive collection of pre-programmed web pages, but also allow the user to put a custom HTML "wrapper" around the embedded web site. The IB-100 is programmable using Script Basic!. ValuPoint® Programmable I/O with Modbus Built In! 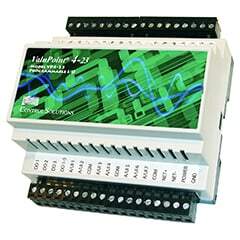 Control Solutions' ValuPoint® VP4-2310 provides a mix of I/O points and a soft PLC with graphical programming that includes PID blocks. The VP4-2310 can operate as Modbus RTU master or slave. Control Solutions' own graphical programming package includes PID function blocks ready to drop onto your drawing. Once you draw out the "schematic" of how your program should run, you are just two click away from executable code to load into your ValuPoint controller.. Here is the classic block diagram of a process under PID Control. What’s going on this diagram? The Setpoint (SP) is the value that we want the process to be. 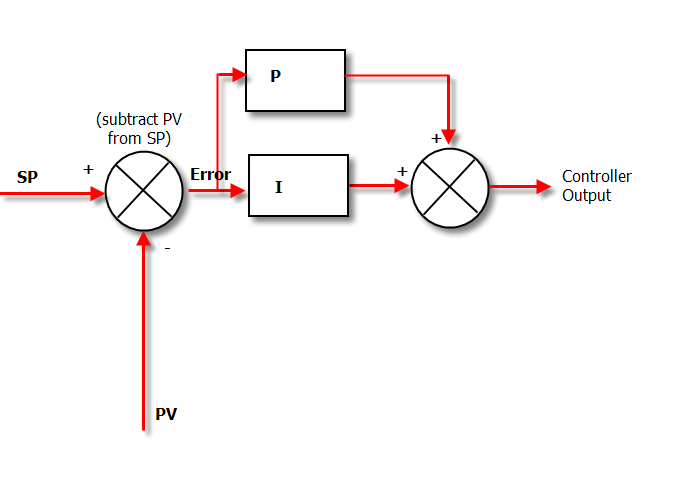 The PID controller looks at the setpoint and compares it with the actual value of the Process Variable (PV). Back in our house, the box of electronics that is the PID controller in our Heating and Cooling system looks at the value of the temperature sensor in the room and sees how close it is to 22°C. If the SP and the PV are the same – then the controller is a very happy little box. It doesn’t have to do anything, it will set its output to zero. However, if there is a disparity between the SP and the PV we have an error and corrective action is needed. In our house this will either be cooling or heating depending on whether the PV is higher or lower than the SP respectively. Let’s imagine the temperature PV in our house is higher than the SP. It is too hot. The air-con is switched on and the temperature drops. The sensor picks up the lower temperature, feeds that back to the controller, the controller sees that the “temperature error” is not as great because the PV (temperature) has dropped and the air con is turned down a little. This process is repeated until the house has cooled down to 22°C and there is no error. Then a disturbance hits the system and the controller has to kick in again. In our house the disturbance may be the sun beating down on the roof, raising the temperature of the air inside. So that’s a really, really basic overview of a simple feedback control system. Sounds dead simple eh? Unfortunately, in the real world we need a controller that is a bit more complicated than the one described above, if we want top performance from our loops. To understand why, we will be doing some “thought experiments” where we are the controller. When we have gone through these thought experiments we will appreciate why a PID algorithm is needed and why/how it works to control the process. We will be using the analogy of changing lanes on a freeway on a windy day. We are the driver, and therefore the controller of the process of changing the car’s position. Here’s the Block Diagram we used before, with the labels changed to represent the car-on-windy-freeway control loop. Notice how important closing the feedback loop is. If we removed the feedback loop we would be in “open loop control”, and would have to control the car’s position with our eyes closed! Thankfully we are under “Closed loop control” -using our eyes for position feedback. As we saw in the house-temperature example the controller takes the both the PV and SP signals, which it then puts through a black box to calculate a controller output. That controller output is sent to an actuator which moves to actually control the process. It is really very simple in operation. 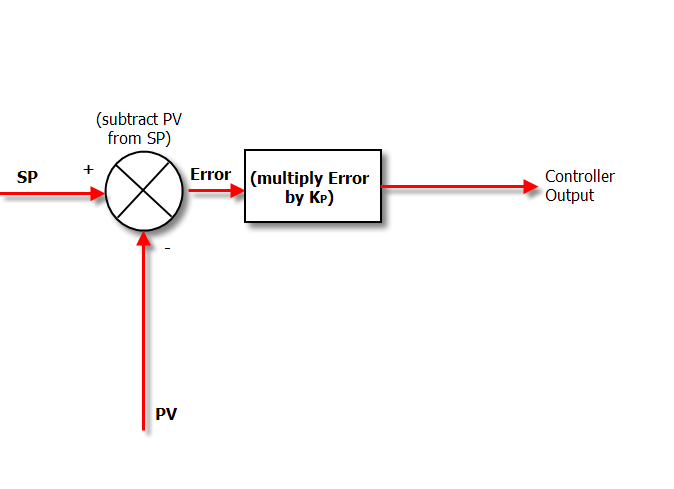 The PV is subtracted from the SP to create the Error. The error is simply multiplied by one, two or all of the calculated P, I and D actions (depending which ones are turned on). Then the resulting “error x control actions” are added together and sent to the controller output. So derivative is just a mathematical term meaning rate-of-change. That’s all there is to it. Is it any wonder that so many people run scared from the concept of integrals and integration, when this is a typical definition? If you understood that you are a smarter person than me. The integral of a signal is the sum of all the instantaneous values that the signal has been, from whenever you started counting until you stop counting. The curious units (degrees Celsius x seconds) are because we have to multiply a temperature by a time – but the units aren’t important. 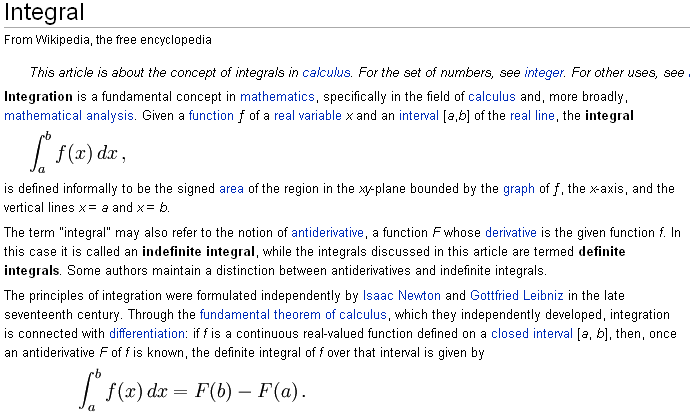 As you can probably remember from school –the integral turns out to be the area under the curve. 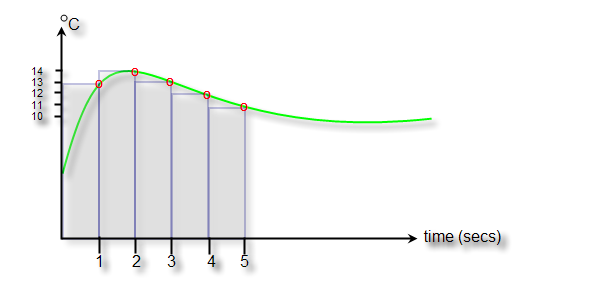 When we have real world systems, we actually get an approximation to the area under the curve, which as you can see from the diagram gets better, the faster we sample. 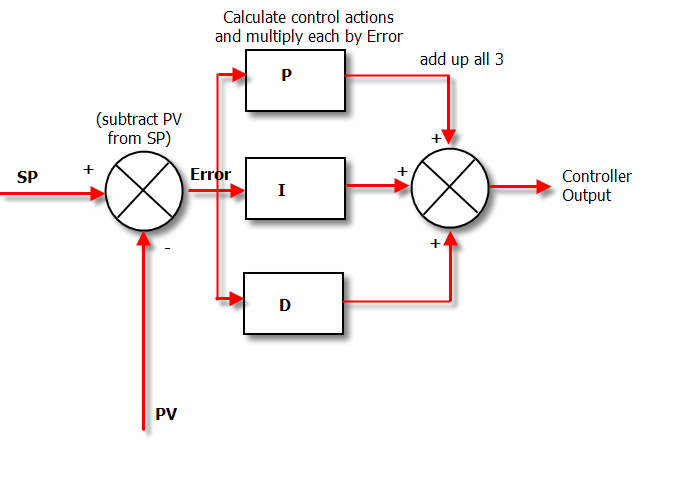 In Proportional Only mode, the controller simply multiplies the Error by the Proportional Gain (Kp) to get the controller output. The Proportional Gain is the setting that we tune to get our desired performance from a “P only” controller. If we put Proportional and Integral Action together, we get the humble PI controller. The Diagram below shows how the algorithm in a PI controller is calculated. The tricky thing about Integral Action is that it will really screw up your process unless you know exactly how much Integral action to apply. A good PID Tuning technique will calculate exactly how much Integral to apply for your specific process - but how is the Integral Action adjusted in the first place? The way to adjust how much Integral Action you have is by adjusting a term called “minutes per repeat”. Not a very intuitive name is it? So where does this strange name come from? It is a measure of how long it will take for the Integral Action to match the Proportional Action. In other words, if the output of the proportional box on the diagram above is 20%, the repeat time is the time it will take for the output of the Integral box to get to 20% too. And the important point to note is that the “bigger” integral action, the quicker it will get this 20% value. That is, it will take fewer minutes to get there, so the “minutes per repeat” value will be smaller. In other words the smaller the “minutes per repeat” is the bigger the integral action. To make things a bit more intuitive, a lot of controllers use an alternative unit of “repeats per minute” which is obviously the inverse of “minutes per repeat”. The nice thing about “repeats per minute” is that the bigger it is - the bigger the resulting Integral action is. OK, so the combination of P and I action seems to cover all the bases and do a pretty good job of controlling our system. That is the reason that PI controllers are the most prevalent. They do the job well enough and keep things simple. Great. But engineers being engineers are always looking to tweak performance. They do this in a PID loop by adding the final ingredient: Derivative Action. So adding derivative action can allow you to have bigger P and I gains and still keep the loop stable, giving you a faster response and better loop performance. If you think about it, Derivative action improves the controller action because it predicts what is yet to happen by projecting the current rate of change into the future. This means that it is not using the current measured value, but a future measured value. The units used for derivative action describe how far into the future you want to look. i.e. If derivative action is 20 seconds, the derivative term will project the current rate of change 20 seconds into the future. And your control output jumps all over the place, messing up your control. Of course you can try and filter the noise out, but my advice is that, unless PI control is really slow, don’t worry about switching D on. Another note from Jim: "Whether learning about PID and how the parameters affect performance, or trying to tune a process, simulation is an important tool for getting PID right. Finn Peacock has a simulation tool available that runs in Microsoft Excel. Over the years, I have written a lot of different simulation programs while developing PID algorithms for everything from industrial process controls to scientific research apparatus on the NASA Space Shuttle. If this spread sheet had been available then, it would have saved me a lot of time. You can get a copy of this simulation tool (screen shot below) as part of the Pro package available from Finn Peacock at www.pidtuning.net. Again, I don't make a dime off this. I just found it valuable and wanted to pass it along."